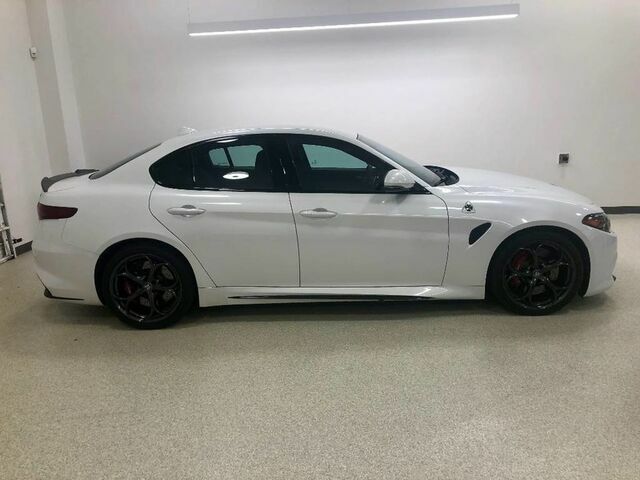 2017 ALFA ROMEO GIULIA QUADRIFOGLIO Trofeo White Tri-Coat Exterior Paint with Black/Ice Interior. 505HP V6 Twin Turbo Engine, 8 speed Auto Trans. One of the most coveted sedans to come to market. Standard options include Front/Rear Park Assist Sensors, Rear Backup Camera, Blind Spot and Cross Path Detection, Passive Entry / Keyless GO, Premium Alarm System, Carbon Fiber Interior Accents, Bluetooth Navigation, SiriusXM, and more! Exclusive Options include Driver Assist Dynamic Plus Package with Adaptive Cruise with Stop, Forward Collision Warning, Lane Departure Warning, Infrared Windshield, Carbon Fiber Active Aero Front Splitter, Harman Kardon Premium Audio System, 19" Dark 5-Hole Staggered Wheels! CarFax Certified One Owner Vehicle. Meticulously Maintained! Garage Kept! Financing and Leasing Options Available! Door to Door Enclosed Transportation Available! Trade Ins Welcomed! For more information call or text 727-423-7819 or visit www.zenmotorsports.net for more details!! ZEN MOTORSPORTS... RESTORING PEACE OF MIND TO THE CAR BUYING EXPERIENCE! !